Discover the legendary city declared as a World Heritage Site. After a pickup with your official local guide at either 10:30am or 10:45am, you will explore the city known as the treasure of three cultures and see the most impressive monuments and learn its curiosities, legends and astonishing historical facts. You will enjoy the famous lookouts of the city in panoramic tour and also have free time to continue enjoying the city by your own and taste its famous sweet marzipan. This 8 hour tour does not include food and drinks and entrance fees to the sites. A comfortable touristic bus will pick you up from Madrid city centre in Plaza de España and Plaza de Carlos V (Atocha) to start this exciting trip. During the bus ride to Toledo, your travel assistant will share the most interesting facts about Toledo and will answer any questions that you could have. You will be immersed in the medieval times and you will know all that you can`t miss in Toledo. In addition, you will be provided a complete tourist map with the main attractions of the city. 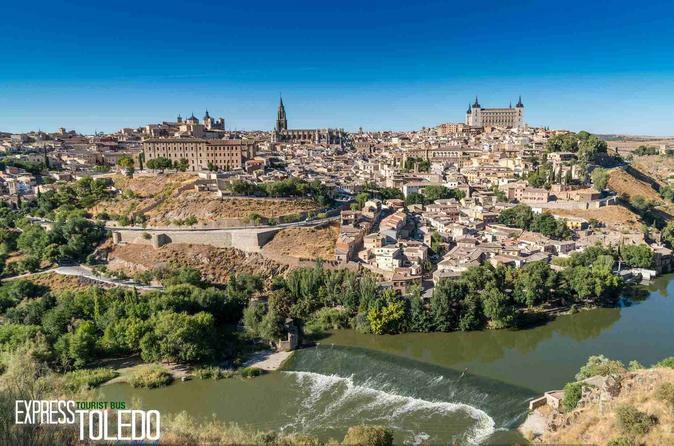 Once in Toledo you will enjoy a two hour guided tour of Toledo, where the the coexistence of 3 civilizations, Christian, Jewish and Muslim, will be the background of stories of epic battles, the important historical facts, legends and curiosities of the city. You will see the Cathedral of Toledo, second richest Catholic building in the world after St. Peter’s Cathedral in Rome, the mystical symbolism of the old Jewish Quarter, learn the legend of the Santa María la Blanca Synagogue, the Monastery of San Juan de los Reyes and the Mosque of the Christ of the Light.